When my great-great-grandmother set out for New Mexico territory in 1866, she spoke no English. Nor did she speak any Spanish. German was her native language; Yiddish as well. 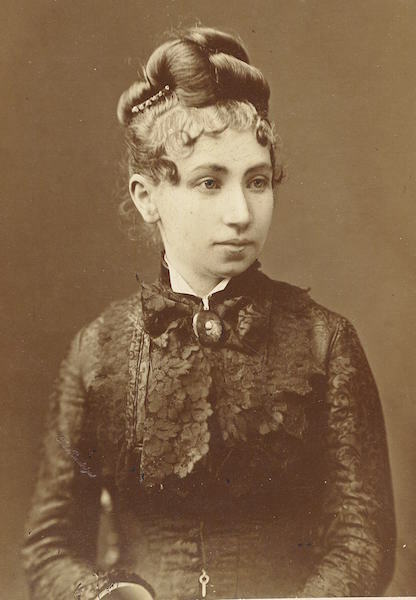 Julia Staab was a German Jew from a small village in Prussia. I don’t know how her marriage to my great-great-grandfather Abraham Staab came about—if it was arranged beforehand, or if they chose each other. But I do know that they were in a hurry to begin their married life in Santa Fe—to inhabit their American Dream. Abraham was, anyway. He had left their village a decade earlier, at 15, to make his fortune. That he did, hauling merchandise—“Hats Boots & Shoes, Hardware, Groceries etc. etc.”—along the Santa Fe Trail between St. Louis and the American Southwest. He became a U.S. citizen on July 10, 1865, only a few weeks after the last shots of the Civil War were fired, and promptly departed for Germany in search of a bride. 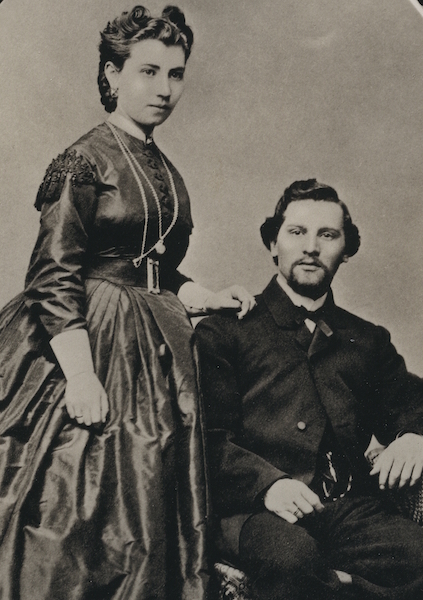 My great-great-grandparents married on Christmas Day, 1865. Julia was 21 years old, Abraham 26. They shipped out on the RMS Scotia, a luxury liner that was at the time the fastest ship on the Atlantic, and on January 12, they landed in New York. From there, they climbed onto a train, and then a steamboat, and then rode for two weeks in a stagecoach across the snow-cloaked Great Plains to make a life among New Mexico’s stark and rugged Sangre de Cristo Mountains. Santa Fe, in 1866, was not yet the elegant city of artists and tourists and well-heeled retirees. It was a rough and unruly town, sandy and treeless. Its central plaza was crowded with carts, wagons, teamsters, roustabouts, soldiers, veterans, fortune-seekers, consumptives, Na vajos, Apaches, Jewish merchants, freed slaves, miners, gamblers, prostitutes, shysters, horses, burros, pigs, and goats—a confusion of commerce, a babel of languages. The houses were constructed of mud, the streets clouded with billowing dust. Beyond the town’s edges stretched a bewildering landscape of uncompromising sky and chisel-topped cerritos, so different from anything a young bride from the green and gentle valleys of northwestern Germany would ever have seen. New Mexico was all tans and reds, the ground littered with rocks and reptiles, with hematite-seeped rocks and bleached bones and spiny flora—cactus, greasewood, Spanish bayonet. This desert was, certainly, an unforgiving land. But it was nonetheless a place that seemed willing to forgive the fact that Julia and Abraham were Jews. In Lügde, the village in which they were raised, local records describe a 1866 cholera outbreak that killed “126 people and one Jew.” That Jew was Julia’s cousin Philipp Schuster—singled out because, in Julia’s time, a Jew in Lügde was not a person but an invasive species, taxed and fined and snubbed at every turn. Not so in Santa Fe. In the New Mexico that Julia encountered in 1866, the newspapers of the territory spoke kindly of the local Jews (“Many of the best residents are of the Jewish faith,” wrote the Santa Fe New Mexican). Perhaps this was because the Jewish merchants were advertisers, or perhaps because there weren’t enough of them to seem threatening. There were, in Santa Fe, no temples, no Hebrew schools, no Jewish ghettos. The stores stayed open on Saturdays; a rabbi traveled from Denver every few years to circumcise the boys. My great-grandmother Bertha’s diaries from those days mention riding parties and sewing circles and teas and Christmas celebrations with gen tile and Jewish friends alike—champagne and oysters, boxes at the Albuquerque opera. But not once in the diary did she mention the fact that her family was Jewish. It didn’t seem to matter. The Staabs were American. They occupied the heart of Santa Fe, with a huge storefront right on the Plaza and a towering family mansion—a mansard-roofed French Second Empire–style brick building—just a few blocks away. The three Staab girls rode sidesaddle and carried gold-headed riding crops. The four boys wore tennis whites and striped sweaters. Abraham was elected county commissioner twice; he helped bring the railroad, the gasworks, and the territorial prison to Santa Fe. He prospered alongside this former Mexican outpost: brick by brick, railroad tie by railroad tie, he worked to transform Santa Fe from a foreign colony into an American city. The town was parched and unkempt and far from the “civilized” world. But Abraham flourished in that hard soil. Julia did not. She struggled there; indeed, she seemed to wither in the desert. She bore seven children in quick succession, and lost an eighth. She suffered miscarriages and health problems, and from “hysteria,” as they called it then. Whenever she fell into a decline, she traveled to Germany to recover, visiting heal th spas and German doctors and her many sisters who lived there and tended her when she was unwell. 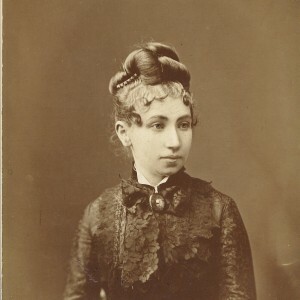 Julia was the only one of the family’s eight girls to leave Germany. She felt terribly unlucky to have done so. In her last years, Julia shut herself in the upstairs bedroom of the European brick home her husband had built among the adobes, and never left. 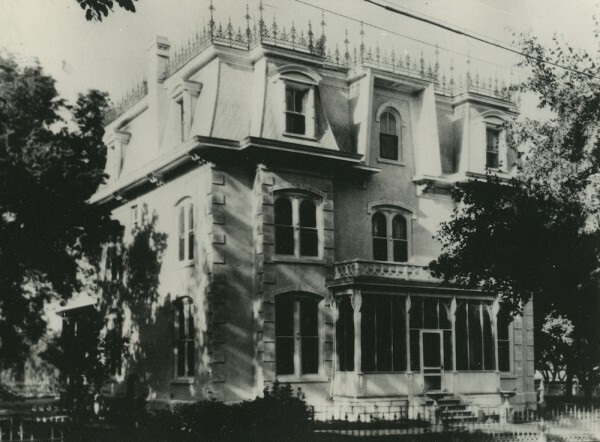 While the family celebrated weddings on the ground floor, she stayed upstairs in her room, and she died there in 1896. It is said that her ghost still haunts the building. And that she was also haunted: by the life she might have lived in Germany, and all that she had left behind. Of course we, who came after, know what became of all that she left behind—what became of her nieces and nephews and of her sister Emilie, who lived long enough to die, at the age of 81, in a Nazi concentration camp. We know how it ended. And we are haunted by a ghost life, too—the life that might have been ours, had Abraham not dragged Julia across the ocean and plains to this open desert land. 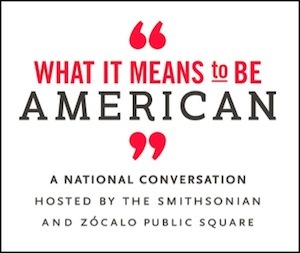 To become American is to accept a staggering loss of self—of the people we once were, in the places we once came from. It may take a generation, perhaps two. But inevitably, it transpires. The surge of conquering culture sweeps down through the generations, much as the spring floods scour the desert arroyos. Washed away, we must lay down new roots. Julia believed her life in the desert was a curse. But five generations downstream, I find that I can’t agree with her. That sere and serrated Western landscape is the only place I have ever felt at home. My father and grandfather came from there; my great-grandmother too. The high desert is in my blood. And I can only see that it was a blessing. Since American Ghost came out, I’ve received emails from a number of readers sharing their own memories of Julia Staab, her family, La Posada Hotel, her ghost, and ghosts in general. Distant cousins have sent me family photos of Julia’s siblings and nieces and nephews; hotel guests and Santa Fe visitors have sent me stories of their own ghost encounters. I had always hoped that, when the book came out, I’d gather more information about Julia’s life and family — tidbits that were hidden in family keepsake books or photo albums. I also was curious whether people continued to have encounters with the ghost of La Posada. Now I am beginning to hear some of those stories, and I will update this blog to share them as they come in. If you have any stories to share, please send them my way! You can reach me via email here. I got a call the other day from Judith, the dowser who appeared at the end of American Ghost, and who (spoiler alert) tried to help put Julia’s spirit to rest. In the interest of crowdsourcing Julia Staab, I am sharing both family stories and ghost stories. I’m particularly keen on hearing from anyone who’s had an experience at the hotel. A few weeks ago, I received an email from a man named Marty Smith, who lives just a half-hour drive away from me, but whom I’d never met. Marty is my fourth cousin, descended from Ben Schuster–Julia Staab’s brother, who came to Santa Fe shortly after Julia did, and lived with the family, working as a “drummer,” or traveling salesman, for the family dry-goods business. 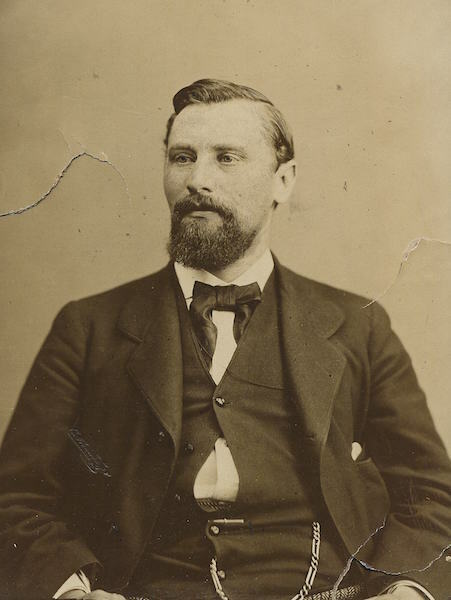 In the late 1870s, Ben left Santa Fe and moved to El Paso, where he set up his own merchant firm with his (and Julia’s) brother Bernard. Ben married a German-Jewish woman there, and raised a family, of which there are many descendants. Since American G host came out, I’ve received emails from a number of readers sharing their own memories of Julia Staab, her family, La Posada Hotel, her ghost, and ghosts in general. Distant cousins have sent me family photos of Julia’s siblings and nieces and nephews; hotel guests and Santa Fe visitors have sent me stories of their own ghost encounters.